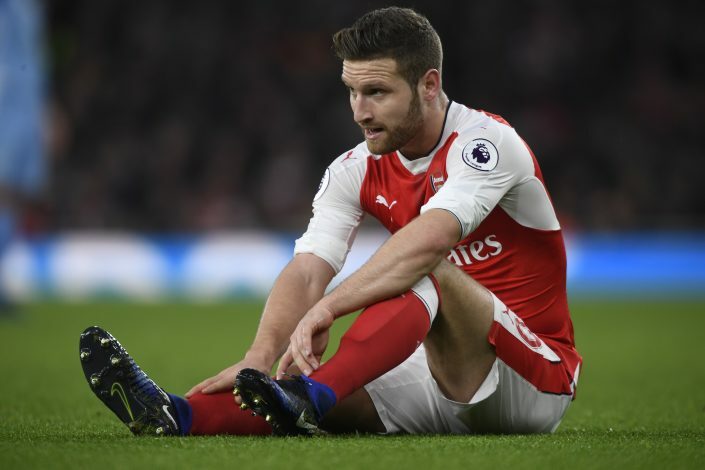 Arsenal manager Arsene Wenger has confirmed that centre-back Shkodran Mustafi might be sidelined for minimum three weeks due to a hamstring strain he picked during Saturday’s 3-1 win over Stoke City. Mustafi had no choice but to leave the pitch after only 25 minutes at the Emirates, giving a massive injury blow to the in-form Gunners ahead of the busy Christmas period. The German defender formed an excellent partnership with Laurent Koscielny since his £35 million summer transfer from Valencia, but Arsenal will now have to strengthen their backline without him for several crucial league fixtures, including next weekend’s challenge against Manchester City. Mustafi was given a much-needed rest in Arsenal’s midweek Champions League match at Basel, and Wenger confirmed that he had been carrying a slight knock ahead of that game as well, but was cleared by the medical team ahead of Saturday’s league fixture. Mustafi was replaced by the returning Hector Bellerin against Stoke, with Gabriel Paulista switching back to his natural centre-back role after starting the game at right-back. Gabriel’s form has been really good in recent games, but losing Mustafi still disrupts what has been a rock solid defensive unit for Arsene Wenger. Meanwhile, the win against Stoke took Arsenal provisionally top of the Premier League table on goals scored, although Chelsea have the chance to reclaim the lead on Sunday.